Making a remake of a popular film can be dangerous waters to tread. How much do you change? What do you keep the same? Will the new actors be as good as the old? Etc. When they said they were remaking Footloose I am sure die hard fans of the original were not pleased. I personally wasn't a huge fan of the first one...not being at all drawn to Kevin Bacon, so I was kind of indifferent. 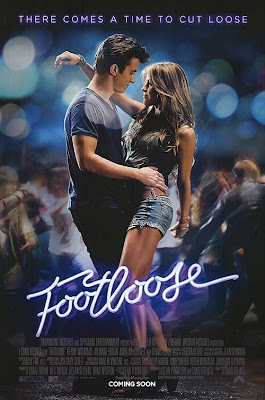 The Footloose remake was actually better than I expected. I much prefer Julianne Hough to the man-woman who played Ariel in the first movie and obviously I thought the new Ren was better than Bacon because I am not a Bacon fan. The new movie was very similar to the first. Some of the lines were exactly the same and some of the scenes were a cut and paste. It was unfortunate that they put in the Ren solo warehouse dancing scene in again because I hated it the first time around and it wasn't any better the second. I liked that new Ren was fro Boston. I love the Boston accent...when it is used for the duration of the movie. One minute he is from the streets of Boston and the next he is from a mid-west town and has no accent. Tisk tisk, not acceptable. I still think that the concept of the movie is outrageous...a town that banns pretty much everything because some kids died in a car accident...stupidity. Absolute insanity if you really think about it. Having a town hall meeting to plead for a senior dance...makes your head want to explode a little doesn't it? All in all the movie was some good entertainment and a fun trip down memory lane. John Lithgow played a way better insane father and totally owned the pulpit over Dennis Quaid, but that it is be expected....it's John Lithgow we are talking about here.